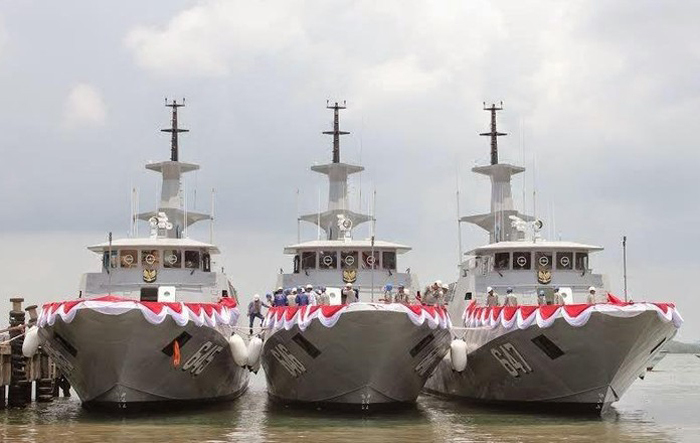 JAKARTA, -- The vessels, KRI Surik (645), KRI Siwar (646), KRI Parang (647), were commissioned in September 2014 by then Indonesian defence minister Purnomo Yusgiantoro. In a statement published by KOAMRABAR on 3 August, the command described the KCR-40 as a suitable platform for the western region's relatively shallow waters and a landscape inundated with clusters of small islands that allow for 'hit-and-run' operations against larger surface combatants. Surik , Siwar , and Parang were manufactured indigenously by local shipbuilder PT Palindo in Batam. The Indonesian Navy (Tentara Nasional Indonesia - Angkatan Laut: TNI-AL) has inducted three KCR-40-class anti-ship missile craft into the service's Western Fleet.